Artists from Voorhees and the surrounding South Jersey communities are displaying their work in vacant storefronts at the Voorhees Town Center in hopes of beautifying the stores and stimulating interest in local art. 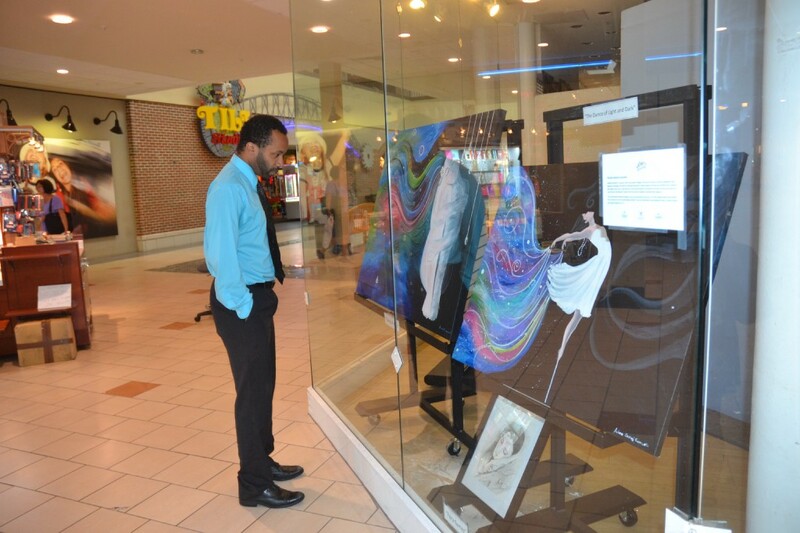 William Phillips, 29. pauses to check out art on display in the Food Court at the Voorhees Town Center’s Food Court. The Arts on the Boulevard exhibit features the work of 29 local artists in vacant storefront on the Voorhees Town Center and Food Court. Artist Marianne Leone had gone to dinner at the Voorhees Town Center one night and was walking along Voorhees Town Center Boulevard when she took note of three empty storefronts in a row. In that moment, inspiration struck. Leone thought: What if instead of being vacant, there was art in these storefronts? Now, there are more than 80 pieces of art on display in vacant storefront windows along Voorhees Town Center Boulevard and at the center’s food court. The “Arts on the Boulevard” exhibit features the work of 29 local artists from Voorhees, Haddonfield and other South Jersey communities. The art went up in June, and the plan is to rotate in new pieces every three months based on seasonal themes, Leone said. On Sunday, Sept. 17, the artists whose work is on display will gather in the mall community room from 2 to 4 p.m. for an Artists’ Reception where members of the public can ask the artists about their work. Leone said she had seen similar arts programs in nearby towns citing Woodbury, in particular, as her inspiration. As chair of the Voorhees Green Team with Sustainable Voorhees, Leone was part of a creative team on the lookout for ways to get points toward a silver certification through Sustainable New Jersey, when she thought of Arts on the Boulevard. She said the team was trying to identify and understand the arts community in Voorhees. So, she approached the Voorhees Town Center on behalf of Sustainable Voorhees with her idea. Greg Kemp, marketing director at Voorhees Town Center, said the idea was a welcome one. He said paper bags on the windows did not have much visual appeal to people walking the boulevard. Thus far, the town center has received overwhelmingly positive feedback about the art, Kemp said. He said the goal is always to get businesses into these vacant storefronts, but in the meantime, the town center is happy to have the variety of pieces beautifying the boulevard. Leone said too often when an artist’s work is done being displayed at an exhibit it is packed up and tucked away in attic or a basement. She said she liked the idea of offering up artists’ work for the general public’s consumption. Leone, a Voorhees resident who has been involved with the Markeim Arts Center in Haddonfield, said she reached out to Markeim and other local artists she knew to give them a shot at some exposure. Bob Hochgertel, chief operating officer at Markeim, said while the Markeim frequently displays local artists’ work, not every artist’s work fits into its rotating themes. For that reason, Markeim decided in 2014 it wanted to start promoting artists’ work beyond its own four walls. Hochgertel said its own initiative, Markeim on Main, has had Markeim artists’ work on display along Kings Highway, and last year, it partnered with local businesses in Pitman to display Markeim artists’ work. When Leone reached out a few months ago, Hochgertel said it sounded like another great opportunity for artists to get some exposure. Putting art on otherwise vacant storefronts is not only an opportunity for artists but for the public, Hochgertel said. He said people can see art decorating walls every day and not engage with it, but putting art in a context where it wouldn’t usually be makes people consume art in a way they might not otherwise. “It’s a very deliberate moment to kind of make people pause and also take in their surroundings and recognize the labor the artist went through to create this piece of art,” Hochgertel said. Haddonfield resident and Markeim artist, Carol Gooberman, who has three of her pieces on display, echoed Hochgertel’s sentiments, saying the exhibit benefits the creators and consumers alike. Voorhees artist Charles “Bud” Lamielle said Arts on the Boulevard is an opportunity for locals to see the depth of talent around South Jersey. He said he submitted a few of his photographs to be displayed, and he’s enjoyed walking the boulevard to see not only his own pieces but the variety of art that local artists submitted. Members of the public can get artists’ contact information to inquire about the art they see at http://www.sustainablevoorhees.org/news/artsontheboulevardprogram-summer2017 or by attending the artist reception on Sept. 17 from 2 to 4 p.m.